Kensington, Brooklyn: Worst or Artist Expression? From Brownstoner: Leonard Lopate has just kicked off a contest to find the worst buildings in New York City. Is there a building in New York that you thinks is really ugly, or has a fatal design flaw? Think that house or parking garage in your neighborhood is an eyesore? Then take a photo, and send it to us! 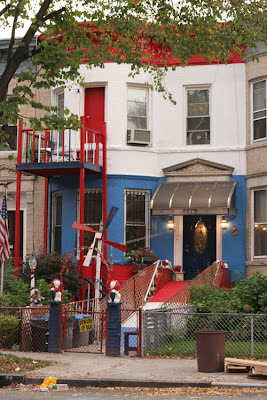 We go back and forth w the above house on E8th St. Do you think is a nominee or interesting artistic expression? (By the way! We have to update the picture also b/c the owner just painted on American flags underneath each porch light).